On September 30, 1948, a crowd of Houstonians gathered on a Gulf Freeway overpass to witness the dedication of Houston's first freeway. 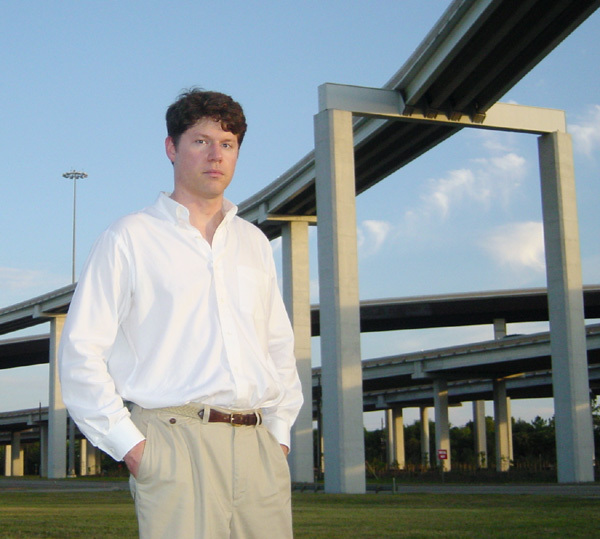 Houston's freeway journey began. Houston Freeways traces the history and influence of the freeway system with extensive photography, fascinating stories, remarkable people and time capsules from the past. TexasFreeway.com The web site I launched in July 2000, managed by Ron Jackson since 2004 but dormant for many years. Sharpstown History Frank Sharp's efforts to bring the original seven astronauts to Sharpstown in 1962, and the 1962 Parade of Homes. Identify the location of these historical and aerial photos. I'm a native Houstonian, born and raised in Sharpstown near the Southwest Freeway and a 1985 graduate of Sharpstown High School. The history of the Southwest Freeway (US 59) and Sharpstown is the quintessential 1950s-1960s story of the rise of freeways and freeway suburbia, and is covered in detail in the "Spokes" chapter and the Southwest Freeway excerpt. I grew up always wanting to know more about the history of Houston's freeways but there was no comprehensive history, only occasional news reports and project-specific documents from TxDOT. In the 1980s I came across L.A. Freeway, a 1981 book which documented the history of Los Angeles freeways, and I thought to myself, "Someone needs to write the freeway history book for Houston." I received a BSME from Texas A&M in 1989 and an MSME from UT-Austin in 1990, and I worked in the energy industry at the Schlumberger Sugar Land campus in the 1990s until I switched to the technology industry in 1998. When the high-tech bust hit in 2001-2002 I was indefinitely unemployed and I realized that I was the person to write the book. 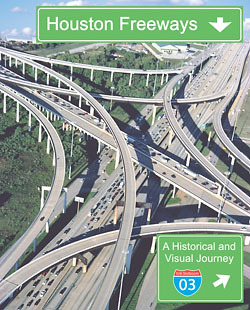 Houston Freeways, A Historical and Visual Journey was published in September 2003. Response to the book exceeded expectations, with all 5000 copies distributed by November 2004. Used book prices have always been well above the original retail price for the new book ($35). The free download eBook was placed online in 2005 and in 2013 the book is still steadily viewed. In fact, interest in Houston Freeways remains much higher than my 2012 effort, Dallas-Fort Worth Freeways, Texas-Sized Ambition. Yes, Houston loves its freeways and I was glad to be able to document the history for everyone with interest in the subject, now and in the future.